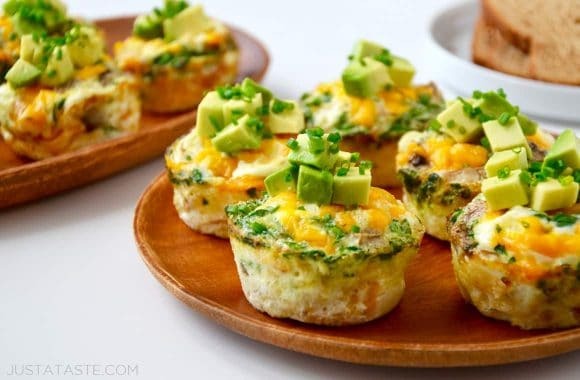 Similar to their culinary counterpart, these egg white muffins pack a whole lot of protein into each and every bite. 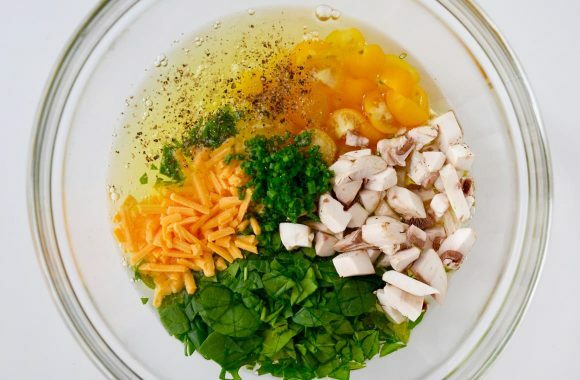 And they’re totally customizable when it comes to fillings, so dream up your ultimate omelette, then whisk all of those ingredients into an egg white base. But perhaps the greatest selling point is their ability to be baked and then popped into the freezer for a quick and healthy morning meal or snack on-the-go. And having an 8-month-old has brought a whole new meaning to multitasking. I’m a breakfast super-enthusiast, so when mornings are rushed (i.e. 8 out of 7 days a week! ), I grab one or two of these muffins from the freezer, pop them in the microwave for 1 minute and then enjoy a hot meal in one hand while holding my little guy in the other. And in case you missed our recent announcement, we’re now serving up nutrition facts alongside many of our most popular recipes. You’ll find the facts, which are calculated by a registered dietician, right below the recipe. And you guessed it! We’ve included Weight Watchers SmartPoints as well. The skinny on this recipe? 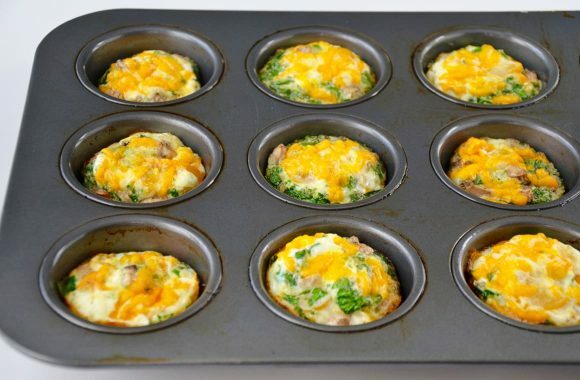 Two egg white muffins clock in at exactly 100 calories! So now you can indulge in a homemade breakfast that’s warmed in minutes and packed with protein and vegetables to keep you going all day long. 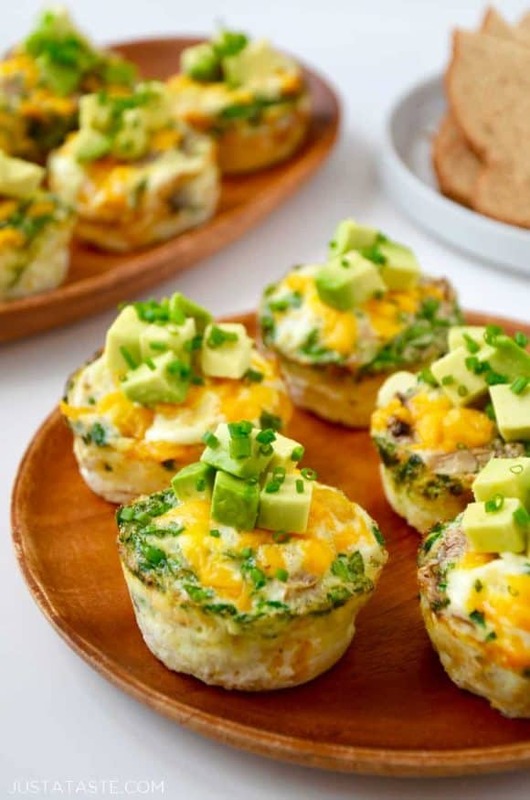 Top off the egg white muffins with diced avocado and/or a dollop of salsa and healthy eating has never been more delicious. Looking for more recipes with nutrition facts? 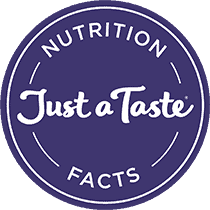 Don’t miss our new Nutrition Facts recipe category for figure-friendly options for breakfast through dessert! In a large bowl, whisk together the egg whites, spinach, tomatoes, mushrooms, cheese, chives, 1/2 teaspoon salt and 1/4 teaspoon pepper. 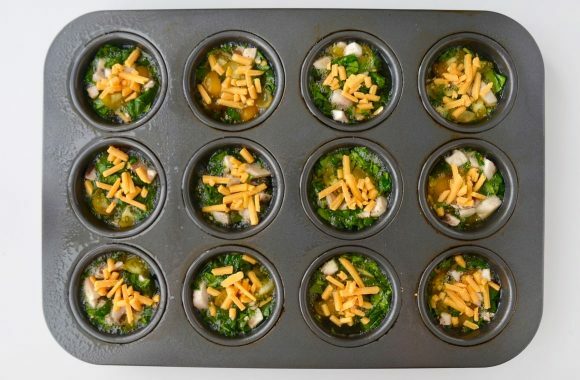 Divide the mixture evenly among the 12 muffin pan cups. Bake the muffins for 20 to 25 minutes, or until the egg whites are fully cooked. Remove the muffins from the oven and let them cool for 5 minutes in the pan before using a knife to loosen the muffins from the cups. Top each muffin with diced avocado and serve immediately or if freezing, transfer the fully cooled muffins to a sealable plastic bag and store them in the freezer. To re-heat: microwave the muffins for 45 seconds or until thawed then top them with the avocado and serve. The nutritional data provided in the table above was calculated by a Registered Dietician inputting the ingredients and amounts used into SuperTracker, a nutritional database program that is approved by the United States Department of Agriculture (USDA). The figures are an estimate based on the ingredients and amounts used to prepare this food item and should not be considered to be 100% accurate, as results may vary depending on the type of ingredient or amount used to prepare this food item.